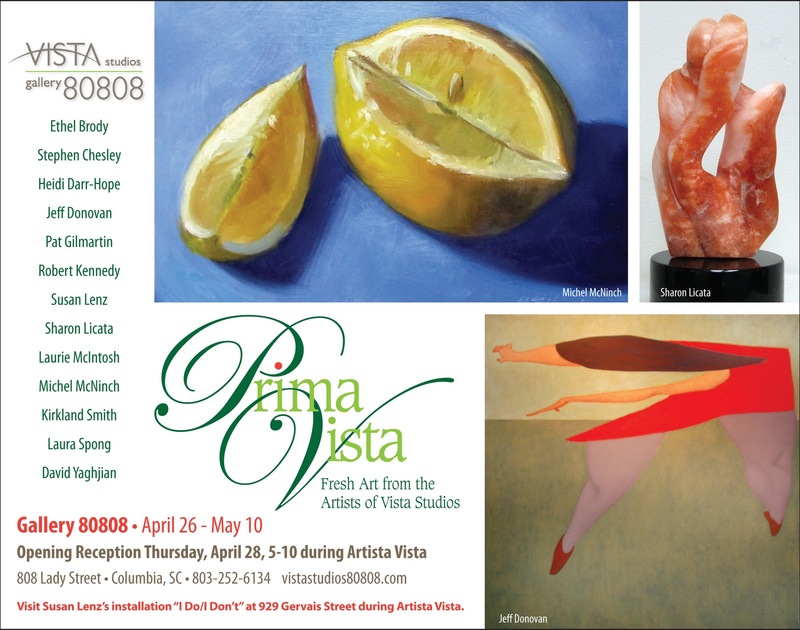 Vista Studio’s 13 resident artists invite the public to view “Prima Vista: Fresh Art at Vista Studios”, which will be on display April 26- May 10, 2011. There will be an opening on April 28th, from 5:00-9:00pm, during the Artista Vista Celebration. Come see our new exhibition at VistaStudios/Gallery 80808 located at 808 Lady Street in the Vista. The artists will have their studios open for you to get a look at their newest work and processes. Non-objective painter, Ethel Brody, continues experimenting with structure and color in her “stripe” series. Taking visual clues from her daily life, she creates colorful, highly organized compositions with strong graphic qualities. Stephen Chesley continues to offer the results of his dedication to painting. In “Orsman”, he alludes to Walter Inglis Anderson, after his following of Ralph Albert Blakelock and Albert Pinkham Ryder- a notation of the incredible art spirit of all three. In “Trees, Slight Wind”, Chesley experiments with George Inness’ application of the Swedenbourgian esthetic. Pat Gilmartin’s ceramic sculpture is presented as figurative works in contexts provided by found objects, making for interesting and ambiguous narratives. In “Magic Potion,” for example, two people interact with each other as well as with their own images as seen in a mirror. The meaning of this narrative is left to the viewer to interpret. Fiber artist, Susan Lenz, will present a new art quilt called “Endless Life” in the ongoing Grave Rubbing Art Quilt Series. Constructed from crayon-on-silk grave rubbings made in Lydford, England, the state of Maine and the District of Columbia, the series focuses on a profound sense of time, personal and universal mortality, and the ache of remembrance through passing generations. “Genius” was inspired by just one of dozens upon dozens of donated, mateless socks given for a public art project called “Looking For a Mate“, sponsored by the Congaree Vista Guild at River Runner during last autumn’s annual Vista Lights event. Lenz will also display an installation of tagged keys called “Wall of Keys”, including “The Key to Happiness”, “The Key to Knowledge”, and “The Key to the Future”. Sharon Collings Licata, sculptor, will exhibit works using Orange Utah Alabaster. In “Hand Aflame”, she creates an abstract where one can see both finger and flame shapes speaking to the color of the stone. In “Mountain Sunset”, the curves of the “hills” and ridges capture the orange light. pastels on paper are about body language and the idea of expressing and capturing an idea of a particular communication in a single image. Michel McNinch is working on a fresh crop of new landscapes depicting the beauty of our state, from the mountains to the coast. Kirkland Smith continues her work with post-consumer waste to create “3-Dimensional paintings” that from a distance appear representational but as the viewer moves closer become abstract- and the materials used come into focus. Artists Jeff Donovan, Heidi-Darr Hope, Robert Kennedy, Laura Spong, and David Yaghjian will also present new work and open their studios at Vista Studios. The exhibition will be from April 26- May 10. Gallery hours are weekdays 11 a.m. to 3 p.m. and weekends 1-4 p.m. Please call the Gallery 80808 at 803-252-6143 to confirm hours. Their website is: www.VistaStudios80808.com.